Tasmania is a unique island with a unique flora. Its varied landforms – rugged mountains, high lake covered plateaus, lowland plains and valleys and sand dune coastlines interrupted by rocky headlands – provide a variety of habitats that are occupied by almost 2000 native plant species. Of these, about 300 are endemic to Tasmania (occur nowhere else in the world). Up to about 65 million years ago, our land mass was part of the Supercontinent, Gondwana. 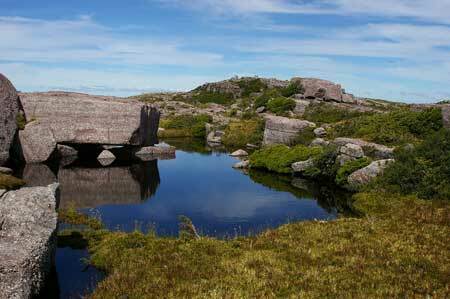 The rugged mountain landscapes in particular have served as a refuge for plants from that era. Thus many of our endemic species are descendants of the flora of Gondwana. Our unique flora is habitat to a unique fauna. Our mammals, (about 34 species) and birds (about 225 species) are just the more visible parts of an intricate food web that is reliant on the producers of the ecosystem – the plants. Since European settlement, much of the native vegetation has had to give way to grow food and fibre crops. Also, for aesthetic needs we have replaced native vegetation with a range of plants from Europe and elsewhere – to make us feel more at home. For those of us who feel very at home here, Habitat has the plants to bring back the feel of original Tasmania. Why grow native Tasmanian plants? Enjoy the subtle yet intense beauty of our native flora. Reduce water and fertiliser use. Plants from your area are adapted to the local climate and soil conditions. With careful selection you can grow plants that need less water and fertiliser and increase your success rate. Provide habitat for native animals. Wildlife can be attracted into our gardens by planting local native plants that supply food, shelter and nesting sites. Help maintain biodiversity by providing space for rare or endangered plants. Learn more about our natural heritage. By growing Tasmanian Native Plants we can learn more about them and their environment and thus feel more at home in Tasmania ourselves. Be a good bushland neighbour. Many introduced plants have begun to invade the natural environment to the detriment of the native vegetation. By growing plants native to your region you can help reduce the risk of spreading more environmental weeds. Our catalogue is currently available in PDF. You can choose from the complete catalogue, or our revegetation list.